The Republic of Abkhazia is one of the few countries, if you can call it that, where every tourist who shows up gets a handshake and a friendly chat with the deputy foreign minister. Or rather, it would be such a country, if it were a country at all. 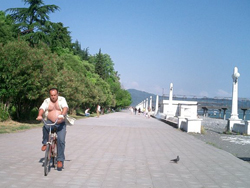 A wee seaside strip in the Republic of Georgia, Abkhazia hasn’t yet persuaded anyone to recognize its independence, even though it boasts many of the trappings of nationhood — a president, a parliament, and an army that guards the border in case the government in Tbilisi wants to invade again.